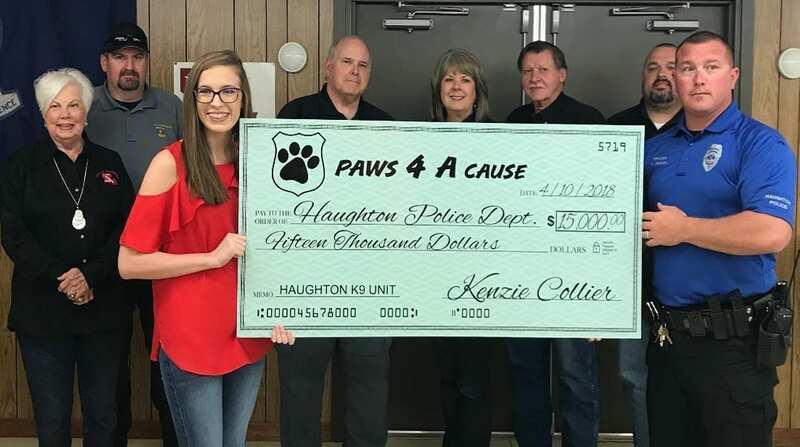 The Haughton Police Department is growing by four paws. The department will be adding a K9 unit to its force thanks to a recent donation by a local teen. Kynzie Collier wanted her senior project to make a difference in her community. She loves dogs and has a great respect for law enforcement so she combined the two. Kynzie designed and sold t-shirts and also held a carnival with food and games at First Baptist Haughton. When she added up her profits, she raised a total of $15,000, which almost doubled her original goal. “It takes anywhere from $8,000 to $25,000 to get a police dog so I feel accomplished,” Kynzie said. Haughton Police Chief Todd Gibson knew the need to add a K9 was coming and Kynzie’s donation will certainly help them accomplish that. It may be a while before the four-legged officer reports for duty, though. Kynzie feels the town will greatly benefit from having a K9 unit. She’s looking forward to meeting the dog and seeing what it can do for Haughton. Kent Collier, Kynzie’s dad, said he’s not only proud of his daughter, but of the Haughton Police Department. Kynzie is a 2018 graduate of Haughton High School and will be attending Louisiana Tech University in the fall. She encourages upcoming seniors to challenge themselves to do something positive for their communities.